A new terminal, designed by Fentress Architects, is coinciding with a new rail service to Miami. 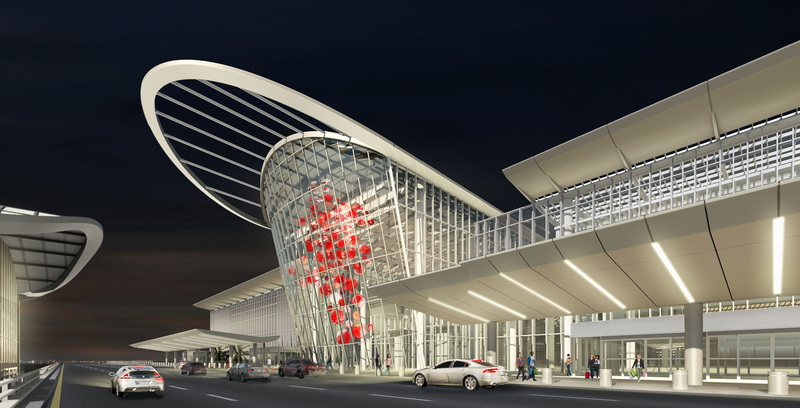 What can Orlando show other cities about multimodal integration and high-touch terminal design? Larger than John F. Kennedy International Airport, Los Angeles International Airport, and Miami International Airport combined, the Orlando International Airport (MCO) is the country’s fourth largest, by acreage. But for all its land wealth, it struggles to move people efficiently. The current terminals can process between 40 and 45 million passengers each year—currently just under 43 million travelers fly into and out of MCO each year—and that limits what the facility can provide in terms of services. On some days, more travelers move through the current terminals than they are designed to accommodate, which leads to exceedingly long wait times and limits what the facilities can provide in terms of service. Soon, however, the airport will break ground on South Terminal C, a $2.2 billion development set to open in 2020 and grow the airport’s capacity to 55 million annual passengers. While the design by Fentress Architects integrates many future-focused elements, one of its touch points is something of a transportation relic: a passenger rail station. Brightline, a privately funded rail service, will soon begin its first leg between Miami and West Palm Beach. Eventually, it will extend north to Orlando and the airport. As cities grow and traffic snarls roads, cities are focusing on building multimodal linkages to make car-free trips more tenable, including to and from airports. Orlando might not be the typical city that jumps to mind when you think of a hub for transportation innovation. MCO does, in fact, have the country’s largest airport rental car fleet. Driving the 235 miles south to Miami, however, can take 5 hours in traffic compared to the 3-hour rail ride promised by Brightline. If successful, the rail integration might be a harbinger for greater intercity transit system integration across the country.